Frans Hals was born in Antwerp around 1582. His family were forced to leave their home and flee to Haarlem during the siege of Antwerp by Spanish troops. Hals studied under the Mannerist painter, Karel van Mander. In 1609 he became a member of the city’s painter’s union and society, the Haarlem Guild of St Luke and began to earn a living by working for the town council as an art restorer. Hals married twice. His first wife Annetje Hamensdochter Abeel died in 1616 during childbirth. A year later he married Lysbeth Reyniers, the young daughter of a fishmonger, who he had employed to look after his children from his first marriage. Hals and his second wife went on to have a further eight children. Unlike his fellow artists of the time he demanded that his patrons came to him rather than for him to leave his family and travel the country to seek out patronage and make his fortune. Frans Hals died in Haarlem in 1666, aged 84 with very little to show financially for his artistic career. He had been penniless on many occasions and had often been taken to court by his creditors. Left destitute, the municipality had little choice but to subsidise him for the last two years of his life. My Daily Art Display today is the oil on canvas painting entitled Young Man Handling a Skull (Vanitas) painted by Frans Hals between 1626 and 1628. On first sight we immediately think of the scene from Shakespeare’s play Hamlet when Hamlet was seen contemplating the skull of Yorick in the graveyard of Elsinore. For many actors and playgoers this scene is a lasting favourite and remains one of the most memorable images of the melancholy Prince. The play was first performed in 1600 so maybe Hals based his painting on that very scene. However art historians would have us believe otherwise, and believe it is much more likely to be a Dutch Vanitas allegory. Vanitas paintings feature an object (or objects) which symbolises our own mortality and the fact that life is short and reminds us of the transient nature of all our earthly pleasures and achievements. The Vanitas paintings are meant as a warning and ask us, the viewers, notwithstanding our age, to think about death . The inclusion of a skull in a painting was a typical motif of a Vanitas painting. However this is more than just a Vanitas painting. In front of us we have a boy holding a skull. His rosy cheeks, similar in colour to his lips, give him a youthful appearance. His right hand reaches towards us as he gestures. See how the artist has skilfully foreshortened his hand in such a way that it seems to be bursting out of the canvas towards us. 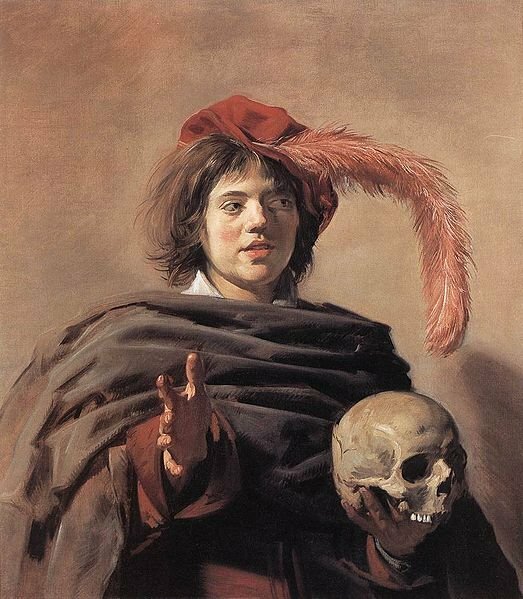 In his left hand is the skull, glowing in comparison to the darkness of the boy’s palm and clothes. The light comes from the left hand side of the painting causing a dark shadow on one side of the boy’s face. This is an interesting portrait. There is a beautiful simplicity about it but let us not overlook the skill of the artist who has given us such a work of art.